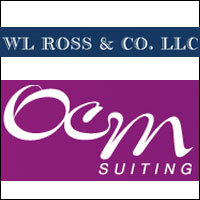 US-based distressed assets-focused private investment firm WL Ross & Co, which owns 94 per cent equity holding in Delhi-based fabric manufacturer OCM India Limited, is exploring further investment opportunities in Indian textile companies, according to a news report by The Economic Times citing a top company executive. "We have looked at some opportunities here and, in fact, some are from the textiles industry," David Wax, managing director of WL Ross, told the newspaper. He, however, did not divulge further details like how much the company has set aside for this purpose and what will be its strategy for the same. The development follows an uptick in fortunes of some textile firms and the recent budget announcement wherein the government laid out several proposals to revive the sector, including an allocation of Rs 200 crore for setting up new textile mega clusters at various cities. WL Ross forayed into India in 2006 by acquiring controlling stake in textile firm OCM India Ltd, known for its tweed and jacket suitings, for Rs 170 crore ($37 million). The acquisition of OCM was pursuant to a Scheme of Arrangement between SK Birla group firm Birla VXL Limited (now Digjam) and its existing lenders, creditors and shareholders, carried out through Asset Reconstruction Company of India (Arcil). This was the first buyout of a major Indian enterprise by a global distressed assets fund. Later on in 2008, the WL Ross invested in Indian low cost carrier SpiceJet, which it exited two years later at a neat profit. The textile sector, much dependent on demand from departmental stores in the developed markets, was hit by the global economic slowdown. However, some of the firms are seeing a revival in business. Some PE firms have already latched on to the sector with Multiples picking a stake in Arvind and Baring PE India buying a stake in Vardhman Textiles.